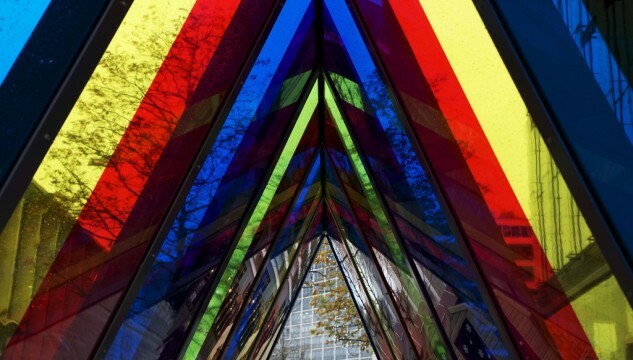 Castlefield Gallery is excited to be working in partnership with Allied London in commissioning artist Liz West to create a brand new installation for Spinningfields, Manchester. Through No. 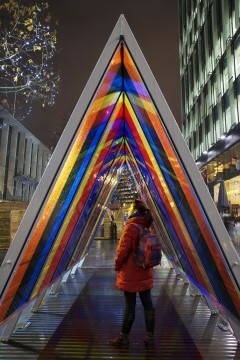 3 will be a six-metre long triangular corridor of light and colour installed on Crown Square in Spinningfields from the 25 November 2015 to Wednesday 6 January 2016. 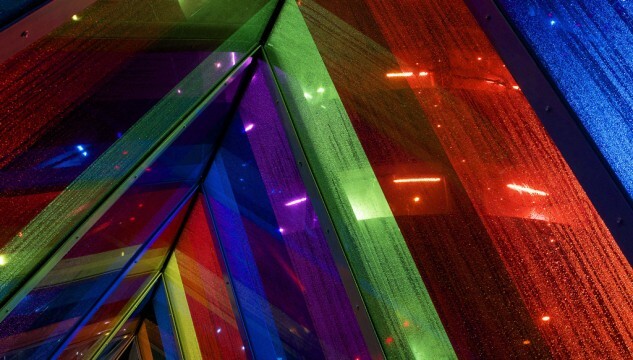 Hot from her major commission An Additive Mix at National Media Museum, Bradford and a Bursary Award from the Royal British Society of Sculptors, Through No.3 continues West’s exploration of colour and light as primary material for artwork. The walk-through structure will encourage visitors to literally look at their surroundings in a different light. Working across a variety of mediums, West creates vivid environments with the aim of provoking a heightened sensory awareness in the viewer. She is interested in exploring how sensory phenomena can evoke psychological and physical responses that tap into our own deeply entrenched relationships to colour. Her intuitive and often playful approach to making sculpture and art installations leads to visually rich works that viewers cannot fail but to be drawn into. Underpinning West’s practice is Josef Albers’ colour theories and his Bauhaus teachings, which she references alongside an informed understanding of Newtonian optics and Goethe’s theory of visual perception. After graduating The Glasgow School of Art in 2007, West now lives and works in Manchester. She was recently commissioned by the Science Museum London to create a new installation for the National Media Museum, Bradford; she exhibited at The Crypt in Leeds Town Hall for Light Night Leeds (9 Oct 2015), and has recently been announced as one of 10 winners of the Royal British Society of Sculptors Bursary Awards 2015. The commissioning of Through No.3 has been managed by Castlefield Gallery. 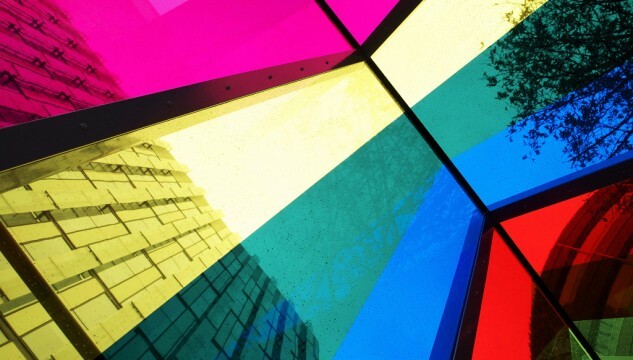 “It has been a pleasure to work with Allied London properties, and Chief Executive Michael Ingall throughout the commissioning and development of this new artwork for Spinningfields. 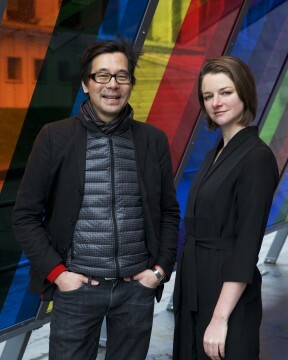 Michael understands the importance of artists and creative practitioners to place making, and so it is fantastic to have had Allied London’s commitment to the delivery of this exciting new artwork by artist Liz West for Spinningfields.” Kwong Lee, director, Castlefield Gallery. 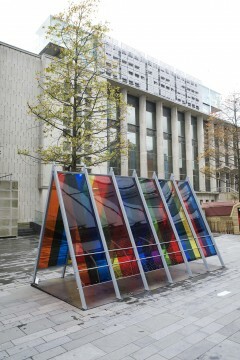 Located: Crown Square, Spinningfields, Manchester.